Okay, people. Here it is. The moment you’ve all been waiting for…. I have pimped my hearing aids. I have jazzed up my hearing aids. I have reached a pivotal moment in my life. I am showing them off and making them stand out by accessorizing them. I needed some new molds recently. My old molds were giving me an absolute fit!!!! They just would not stay in my ears. Every 5 minutes I was having to push them back in…with every move of my jaw they would ease out of my ear canal like an inch worm. Now for someone who likes to talk a lot you can certainly understand how my jaw is constantly on the move. I was ready to curse my hearing aids and put them death. My ear doctor (and if you’ve been keeping up with me on my blog you know she is my fabulously sensitive and compassionate daughter-in-law) recommended some new molds made out of a different material. I’d been looking at some pictures of hearing aids on Pinterest all dolled-up with washi tape and brightly dyed molds…some of them even had glitter mixed in the dye! Oh, yes, can I have some of these, pretty please?!? 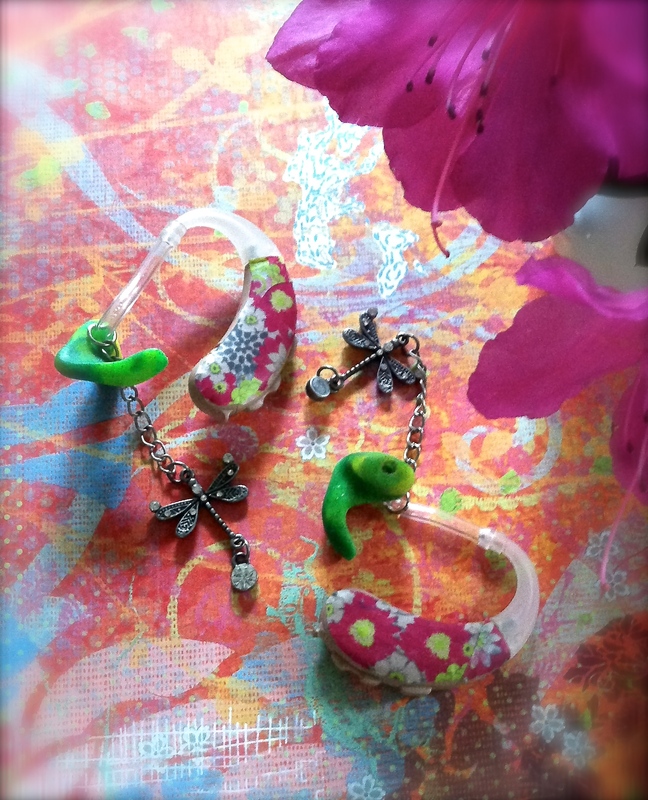 My new molds are actually tie-dyed yellow and green and of course, absolutely, without question….they have glitter. Oooooooooo, I’m so giddy I’m ready to pop out of my chair. I found some really pretty complimentary washi tape at Hobby Lobby and picked out a charm and some chain in the jewelry findings section and twa-LA! (don’t know what that word is, I just made it up) I made a darling little dangle to hang from my tubes. BUT!!!! The best part of all is that my new molds stay in my ears ALL. DAY. LONG. Oh, Sweet Jesus, I think I hear the Hallelujah Chorus…. For anyone who wears hearing aids you’ll understand when I say this is all a very huge, very major, very bold statement for me. When I was growing up they didn’t even make hearing aids to help people with hearing loss like mine. As a teenager, I was so ashamed of being hearing impaired, partly because I was already visually impaired due to the loss of my eye, that I didn’t talk about my hearing loss at all. I didn’t talk about my eye accident. To anyone. EVER. Now you can’t shut me up. I have so much to be thankful for as a child of the King. That’s the real reason I pimped-up my hearing aids. To give me more opportunity to tell people that. God’s riches are so much more than just washi tape and tie-dyed hearing aid molds. So much more than hearing loss and vision loss. So much more than anything on this earth that I think is to-die-for-cool. I can jazz up my hearing aids all I want. I can change the washi tape and change the color of my molds and change the cute little dangles, but I can never change the fact that God’s way of accessorizing my life is better than anything this world could ever offer me. So….ta-da!!! This is the real moment I’ve been waiting for…. God, can I show You off?